Inclusions: Entrance tickets to Fontainebleau, private tour guide, private transportation to and from Paris, taxes, tolls, parking. The palace and parks of Fontainebleau are a magnificent UNESCO World Heritage site. Once a royal hunting lodge, Fontainebleau was enlarged during the Renaissance and transformed into a beautiful palace rich in both Italian and French artistic traditions. 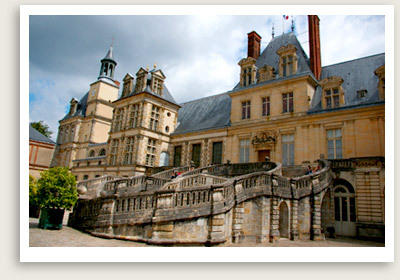 Your Fontainebleau private tour guide will give you an introduction to the history of the palace, which for 800 years was one of the most appreciated residences of the French kings and emperors, from Louis VI to Napoleon III. Your guided tour will show off Fontainebleau’s glorious Renaissance decor, including richly adorned wood paneling, gilded carvings, frescoes, tapestries and paintings. You will view the Trinity Chapel, François 1er Gallery, Ballroom and Royal Apartments. Your Fontainebleau private tour ends after a stroll in the gardens.